AMMONNEWS - The Trump administration will take action against an Iranian ship that has been stationed at a key choke point in the Red Sea for months and is believed to be providing significant military and logistic aid to the Houthi militias Yemen. Washington Free Beacon website quoted on Tuesday US officials and military experts familiar with the situation as saying that the ship which is identified as “Saviz” is an Iranian ship believed to be masked as a cargo vessel has been identified as the “mother ship” stationed in the Red Sea providing targeting information for Houthi anti-ship attacks, which have increased in recent months, including a late July attack by Iranian-backed rebels on a Saudi oil tanker. The ship was delisted from US sanctions by the Obama administration as part of its efforts to uphold the landmark nuclear deal with Iran, US officials confirmed to the Washington Free Beacon. Upcoming Trump administration action against the Saviz and other Iranian vessels is part of a broader package of sanctions expected to kick back in on November 5, officials confirmed. Sanctions will target Iran’s port operations, shipping and shipbuilding sectors, and other affiliates. The Iranian ship “Saviz” , which has been anchored for more than a year in the Red Sea, near the Straits of Bab al-Mandeb in international waters, according to satellite shows, where the ship, which has been carrying commercial containers officially, since mid-2017. Following the comments by the Iranian Revolutionary Guards Commander Nasser Shabani on the commanding of the Houthi militias to strike two Saudi oil tankers near Bab al-Mandab, observers highlighted Iran’s role in threatening the navigation of the Red Sea through this sophisticated radar-equipped vessel and boats equipped with guns to guide militia boats. 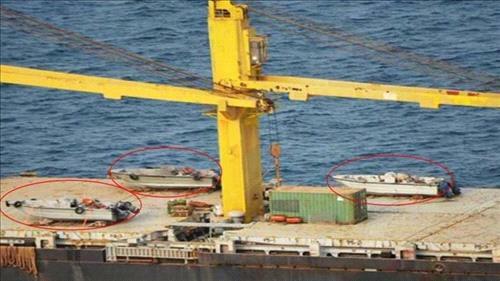 According to Iranian news outlets, many of the weapons handed over by the Iranian regime to the Houthi militias were carried out by speedboats from the same vessel. The boats were equipped with 23 mm ZU guns. Saviz itself is equipped with a radar rarely seen on cargo ships, but used to steer the Houthi militias’ boats when attacking Saudi oil tankers. The commander of the Quds Force of the Iranian Revolutionary Guards, Qasim Suleimani, said that “the Red Sea is no longer safe,” referring to the attack by the Houthi militias, backed by Tehran, an attack on two Saudi oil tankers, indicating Iran’s involvement directly, threatening the navigation in the Red Sea by instructing their Houthi militias to attack tankers. US officials familiar with the Saviz’s actions in the Red Sea told the Free Beacon the Iranian vessel is barely attempting to obfuscate its military role in aiding Houthi rebels in Yemen. The Iranian ship’s suspicious activities have been cited in recent months by US military experts and foreign governments, including the Saudi government, which has been targeted by the Iranian-backed Houthi rebels. US defense experts with the Washington Institute for Near East Policy, or WINEP, also have cited the Saviz as providing potential support and logistics to Houthi rebels as they commit acts of terrorism in the region. “The Iranian military is likely using the Saviz to provide targeting data for Houthi anti-shipping attacks,” according to WINEP. The Saudi government has been tracking the Saviz for more than a year and has documented its extended stay in the Red Sea, activity usual for a typical cargo ship. “Saviz appears to have remained there for extended periods in the months since,” Dyer noted in her analysis. US officials confirm the Obama administration removed sanctions on the Saviz in January 2016, enabling its free travel across the region. Sanctions were lifted as part of US commitments agreed upon under the nuclear deal, which President Donald Trump recently abandoned, paving the way for new economic sanctions on Tehran. The Saviz is just one of numerous Iran-related vessels that received a pass from US sanctions in 2016. Sanctions on the Saviz and other Iranian vessels are set to be re-imposed by November 5, according to information published by the Treasury Department. US military officials with Central Command, or Centcom, which controls American operations in the region, declined Free Beacon requests for information on the Saviz and its operations.